If you are a fan of Monochromatic cards and a Great sketch well then you have come to the right place today! The card was designed for the color challenge over at the Dynamic Duos this week. 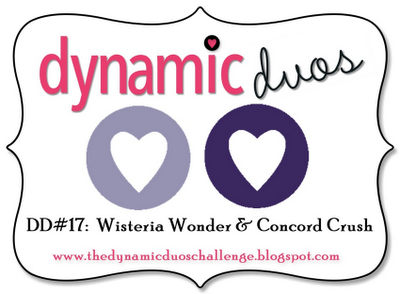 The two colors they chose were Wisteria Wonder and Concord Crush. These colors are a starting point and a guideline and as long as your colors are close enough the ladies are fine with that! 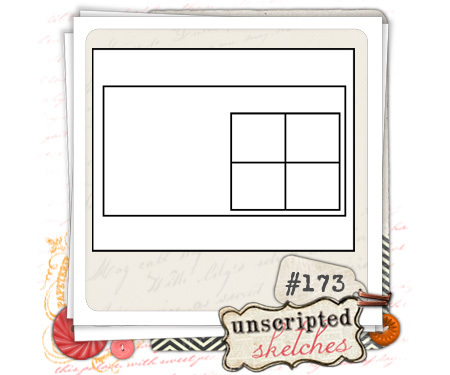 This card also goes along with the sketch of the week over at Unscripted Sketches. I hope it’s okay the I shifted the square over a little bit!!! I am so glad I found this sketch blog!!! 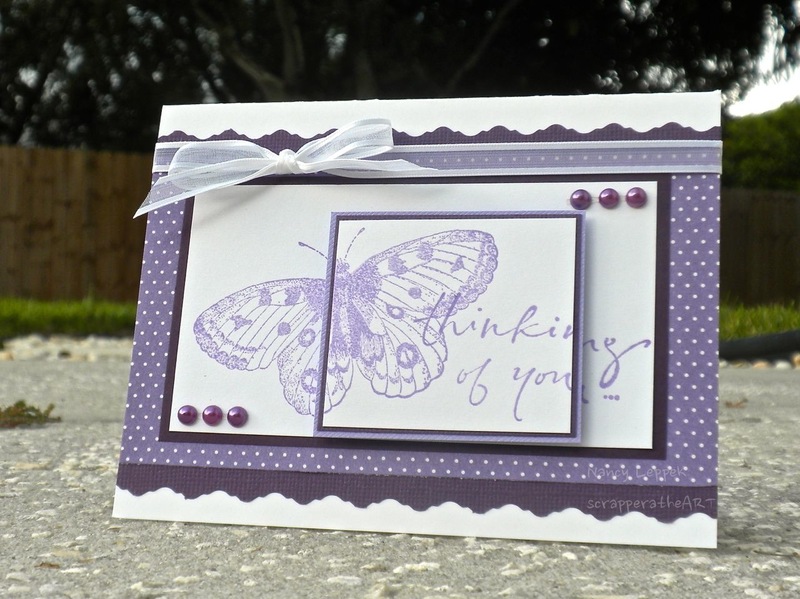 The butterfly stamp is one of my favorites from Stamp TV and is called Take Flight, and the sentiment I have had forever and who knows where it came from! :0 The DP is from Creative Memories when I use to be a consultant. The photo isn’t perfect,but when you look at the card from straight on, I have managed to line up the sentiments almost perfect! I just guessed! I was really lucky! I like the look of this with the raised panel with pop dots and have been meaning to try it for some time now! Categories: Cards, challenges | Tags: Card making, Cards, color challenge, Gkd, rubber stamps, sketches, Stamp TV, stamping, Thinking of you | Permalink. Oh my gosh! This is beautiful! Nancy this is so pretty, the popped up panel really packs a punch! Thanks for playing along with us at Dynamic Duos! Beautiful card Nancy. Fab stamping. Love the positioning of the butterfly. Very clever. What a great card! Love the image and the layout! Such a pretty card! Love the stamping and popped up image! What a gorgeous card Nancy! I adore the stamping you have done on the two boxes, it is soft and very pretty! Thanks for joining us at Dynamic Duos.